The recent notion of encryption switching protocol (ESP) allows two players to obliviously switch between two encryption schemes. Instantiated from multiplicatively homomorphic encryption and additively homomorphic encryption, ESPs provide a generic solution to two-party computation and lead to particularly efficient protocols for arithmetic circuits in terms of interaction and communication. 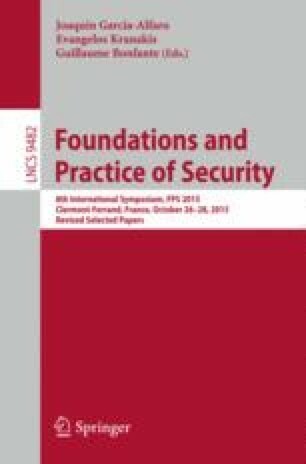 In this paper, we further investigate their applications and show how ESPs can be used as an alternative to fully-homomorphic encryption (FHE) to outsource computation on sensitive data to cloud providers. Our interactive solution relies on two non-colluding servers which obliviously perform the operations on encrypted data, and eventually send back the outcome in an encrypted form to the appropriate players. Our solution makes use of a nice combination of the Paillier encryption scheme and the Damgard-Jurik variant with multiple trapdoors, which notably allows cross-user evaluations on encrypted data. This work was supported in part by the European Research Council under the European Community’s Seventh Framework Programme (FP7/2007–2013 Grant Agreement no. 339563 – CryptoCloud).